Crux is a tangle full of opportunities and variations. It has been very cleverly worked out by Henrike Bratz. I tried to get a bit of a pillow effect happening here but had to be careful with the connecting lines. Thanks Henrike, crux is a beauty! Very nice pillow effect. I love this tangle. The colours are great. Looks great on the Renaissance Zendala tiles. I have not tried those yet. I am guessing it is the same paper as the square ones. Like the irregular edge. It is a simple variation but I think it adds a lot. I like how your aura'ing makes it look like the crux part is coming up from "under" the tile. In fact, I woke up this morning with this idea in my mind...making a corner of something shaded to look like the surface has been opened up to reveal what is beneath. Great color choices. I like the grid lines being inked in, and your edge shading is very effective. Great Tile, Shelly. It looks like the pillow lies on the round tile. Maybe with a tiny little bit of shadow under the pillow, on the tile it's coming loose from the tile. Stunning. So rich looking. I'd like to feel confident enough to just put one tangle on a tile, I think it's so stylish - but tend to panic and add more. Thanks as always for sharing such great art. Hey Shelly. 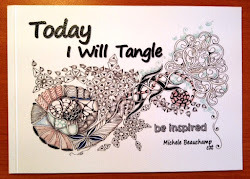 I love your art; always so elegant looking and this new tangle is no exception. 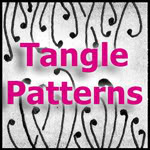 Your mono-tangle on a tan Zendala really looks very nice; a great example for all to follow. Very nicely done. Yes, you certainly got the "pillow" look with your perspective and especially with the shading. Very nice tile and I like it on the round Renaissance too. I really like this tile! It really is a pillow, nice! I like the colors you used! I like the "pillow"! A designer pillow for sure! Lovely as always! I really like the depth you get in the usage of color and design! I do like your pillow design a lot! Wonderful! Really a pillow. Great colouring and shading! Lovely!...and love the pillow illusion - shading is awesome and so are the colors. Love the colour harmony! 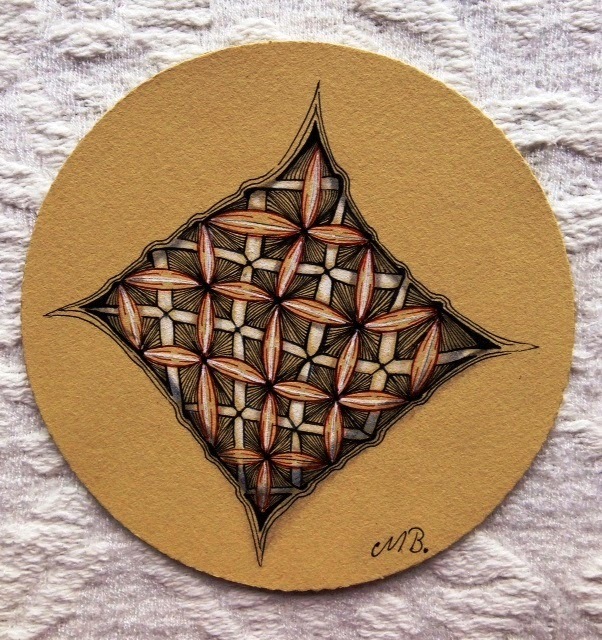 Love a non-mandala on a round tile. Love the pillow effect that you used and it looks great on the Renaissance tile!